Like anyone who feels the urge to create, I make art because I feel compelled to do so. I love it, enjoy it, and sometimes endure it. Long fascinated by the emotional approach to light in the paintings of Rubens, Caravaggio, and fellow Baroque masters, I have always sought to explore the dynamics of light and dark in my own paintings - particularly through depicting the human form in modern interpretations of classical themes. Alongside this I continue to work on an ongoing series of paintings that combine traditional oil painting on canvas with a modern surround of gloss paint to create vibrant studies of the human form, specifically the lines and contours that shape the human face and body. Through fragmentation of image the gloss surround also defines the figure, and influences its tonal and colour palettes. This duality is often taken to various degrees where form is apparent but identity is at times not always clear. I also liken this to the high-contrast ‘chiaroscuro’ and ‘tenebrous’ approach of the old masters through to classic noir cinema. I have studied fine art at Wimbledon School of Art (Foundation) and University of East London (BA Hons) and live and work in Surrey, England. I generally design and plan each painting prior to custom building my own stretchers. The canvas is then stretched, sized and primed before being marked for painting. My gloss series of paintings are often popular with people who want to see a favourite star or loved one pictured in a modern and vibrant way that calls to mind the famous Pop Art portraits of Andy Warhol. Others see a visually striking picture that they find interesting or see an affinity with. 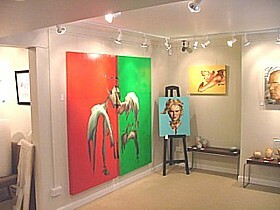 Plus commissioned paintings can also have further input in their creation by choosing the colour scheme to visually compliment the intended display space.